Love this, Monica! I have to “rotate” my dogs and cats for wandering time around the house/front porch, so I can relate. ;0) Great illustration find, too. Thanks, Robyn. I wrote this one when my cat was still alive. Now the dog is on her own and gets to have the final say. Sorry about the loss of your kitty – we recently lost one of our old doggies. He was the most kitty-antagonistic, but I still don’t really trust them all around each other. ;0) We’ve had others over the years that were fine together – they are all so different! Hi, Monica. I especially loved the last two couplets. 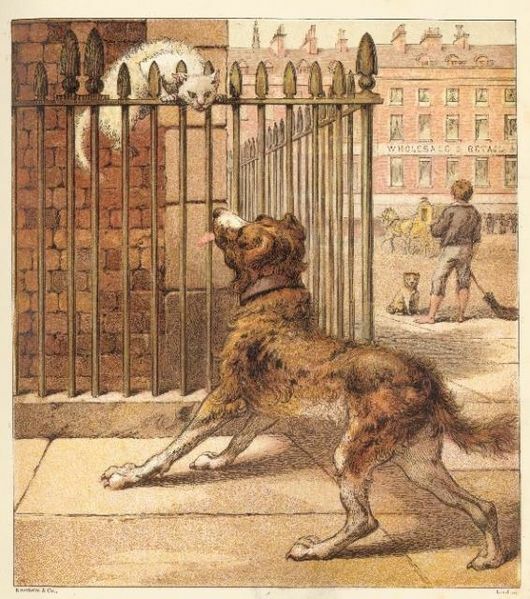 We had a dog and cat when I was growing up who were best friends. One gray, one white — they would sleep curled up like yin and yang. Laura, thanks for your thoughts on the poem. And I love your yin and yang memory. I love the rhythm and the truth of the poem, Monica. It’s so true, some get along and some do not. Definitely! And thanks for your thoughts on the poem. Happy weekend. Your poem really reflects the dog/cat relationship! Very nicely done! I especially like the ending too. You picked a good illustration to go with it. One of our kitties passed away Thursday and I am a bit shell-shocked. Sigh. So sorry, Tabatha. That’s always hard. Love the ending! And great illustration! Thanks, Mary Lee. I’m looking forward to reading lots of your poems on your new site. What a fun poem, Monca! :) Not a bit. Thanks for stopping by, and for your thoughts on the poem, Violet. How cute is this, Monica?! The ending was delightfully unexpected. This blog is new to me– are you keeping The Poem Trail going at the same time? That’s a lot of work! What fun! Love the pairing with picture as well… I don’t think I will ever get tired of pet poems (says the gal with a new puppy!). Thank you for sharing!